Before Jean-François Millet achieved international success as a painter of peasant life, he earned his early living as a portraitist. Here, he depicted Louise-Antoinette Feuardent, the wife of his lifelong friend Félix-Bienaimé Feuardent, a clerk in the library at Cherbourg. In this portrait painted shortly after her marriage, Louise-Antoinette prominently displays her wedding band on her left hand. In a style reminiscent of seventeenth-century Dutch painters, Millet painted the modestly dressed sitter against a plain background using a limited palette. Louise-Antoinette looks out of the picture, her brown eyes calmly assessing the viewer. Through a tightly controlled composition and a careful balance of monochromatic tones, Millet captured Louise-Antoinette's self-containment, reserve, and poised composure. Félix Bienaimé Feuardent, French, 1819 - 1907, commissioned from the artist, along with a pendant portrait of himself; by inheritance within the Feuardent family, 1907. Feuardent Family, by inheritance to Félix Feuardent. Hazlitt, Gooden & Fox, Ltd. (London, England), sold to the J. Paul Getty Museum, 1995. Sensier, Alfred. La vie et l'oeuvre de J.-F. Millet (Paris: A. Quantin, 1881), p. 72. Cartwright, Julia. Jean François Millet: His Life and Letters (London: Swan Sonnenschein & Co.; New York: The MacMillan Company, 1896), pp. 64-65. Moreau-Nélaton, Étienne. Millet raconté par lui-même. 3 vols. (Paris: Henri Laurens, 1921), vol. 1, pp. 33, 49, fig. 14. Cent portraits de femmes, exh. cat. (Paris: Galerie Charpentier, 1950), unpaginated, no. 69a. Palais Galliera, Paris. Tableaux modernes [...]. December 12, 1964, unpaginated, lot 27, ill.
"Cours des ventes [...] En portrait, une femme = deux hommes." Connaissance des arts, no. 157 (March 1965), p. 71, fig. 23. Crombie, Theodore. "Paysans et paysages." Apollo 90, no. 93 (November 1969), p. 433, fig. 1. J.-F. Millet (1814-1875), exh. cat. (London: Wildenstein & Co., 1969), unpaginated, no. 3, ill.
Sutton, Denys. "The Truffle Hunter." 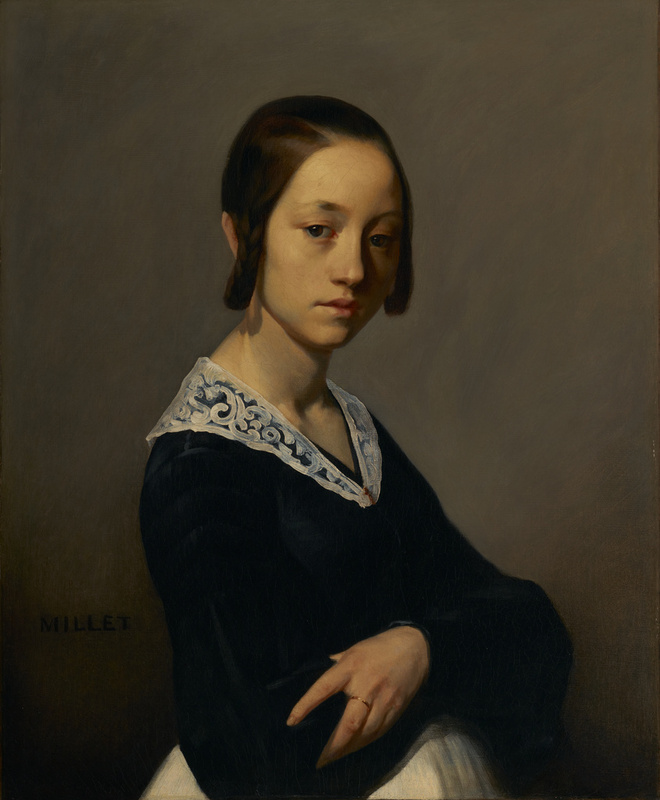 In J.-F. Millet (1814-1875), exh. cat. (London: Wildenstein & Co., 1969), p. iv. Jean-François Millet et ses amis-peintres de Barbizon, exh. cat. (Tokyo: Grand Magazin Seibu, 1970), unpaginated, no. 3, ill.
Lepoittevin, Lucien. Jean-François Millet. Vol. 1, Portraitiste: essai et catalogue (Paris: Léonce Laget, 1971), unpaginated, no. 57, ill.
J. F. Millet, 1814-1875, exh. cat. (Buenos Aires: Galería Wildenstein, 1971), unpaginated, no. 3, ill.
Bouret, Jean. L'École de Barbizon et le paysage français au XIXe siècle (Neuchâtel: Editions Ides et Calendes, 1972), pp. 157, 269, ill.
Mégret, Frédéric. "Millet, l'apôtre des paysans." Connaissance des arts, no. 251 (January 1973), p. 31, ill.
Sasaki, Hideya. Corot / Millet / Courbet (Tokyo: Shueisha, 1973), p. 124, no. 27, ill.
Bouret, Jean. The Barbizon School and 19th Century French Landscape Painting. Jane Brenton, trans. (Greenwich, CT: New York Graphic Society Ltd., 1973), pp. 157, 265, ill.
A Selection of Paintings and Drawings by Jean-François Millet (1814-1875) from the Gallery's Collection, exh. cat. (New York: Wildenstein, 1976), unpaginated, no. 2, ill. "Acquisitions/1995." The J. Paul Getty Museum Journal 24 (1996), p. 115, no. 45, ill.
Jaffé, David. Summary Catalogue of European Paintings in the J. Paul Getty Museum (Los Angeles: J. Paul Getty Museum, 1997), p. 86, ill.
Fredericksen, Burton B., et al. Masterpieces of the J. Paul Getty Museum: Paintings (Los Angeles: J. Paul Getty Museum, 1997), pp. 92-93, no. 51, ill., entry by Denise Allen. The J. Paul Getty Museum Handbook of the Collections. 6th ed. (Los Angeles: J. Paul Getty Museum, 2001), p. 134, ill.
Constantin, Stéphanie. "The Painters of the Barbizon Circle and Landscape Painting: Techniques and Working Methods." Ph.D. diss. (Courtauld Institute of Art, 2001), p. 225. Lepoittevin, Lucien. Jean-François Millet (au-delà de l'Angélus). Colloque de Cerisy (Paris: Éditions de Monza, 2002), p. 74, ill.
Sotheby's, New York. 19th Century European Art. April 24, 2002, p. 34, under lot 31, entry by Alexandra Murphy. Sotheby's, New York. Revolution in Art. January 24, 2002, p. 114, under lot 104, entry by Alexandra Murphy. Allen, Denise, et al. Masterpieces of Painting in the J. Paul Getty Museum. Rev. ed. (Los Angeles: J. Paul Getty Museum, with Thames & Hudson, 2003), pp. 88-89, no. 48, ill., entry by Denise Allen.